FORT WAINWRIGHT, Alaska - The room buzzed with chatter and telephones ringing in the background. The walls were adorned with maps. On one side there was a line of tables, computers and people, on the other side, white boards covered with hand-written information in red, blue, black and green. Ten people were on the phone at the same time providing the latest information to concerned citizens on the other end of the line. "Fire information, this is Marc," echoed across the room, immediately followed by more ringing and, "Fire information, this is Sam." 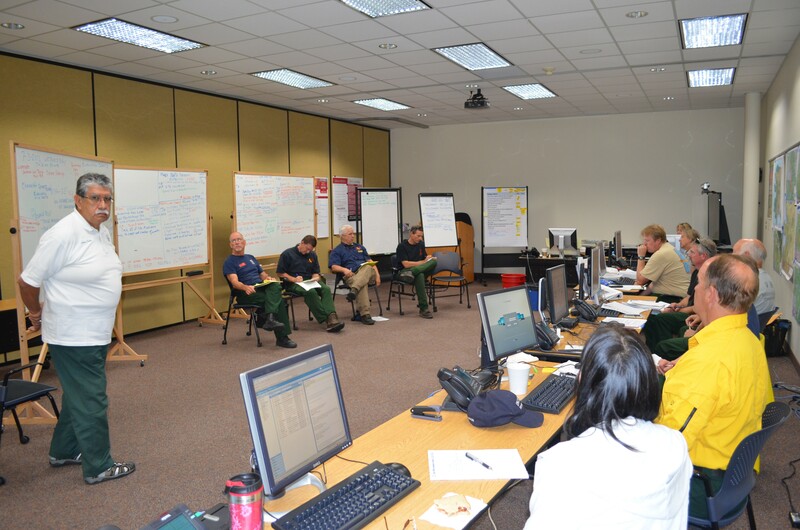 During the Stuart Creek 2 Fire in the Army's Yukon Training Area, a Joint Information Center was activated at the Bureau of Land Management building on Fort Wainwright as part of the Alaska Interagency Coordination Center Interagency Fire Information Center Communications Outreach Plan. "The AICC activates the Joint Information Center, or Fire Information Center, during high fire season or in anticipation of extreme fire-growth potential," said Mel Slater, Public Affairs Office, Alaska Fire Service "Once activated, the JIC becomes the central hub for fire information in Alaska, providing support to the public information officers assigned to incidents or agency units by researching, coordinating and disseminating wildland fire information to the public and media." The JIC was activated July 2 as the fire began to grow. It was one of the 280 fires burning in Alaska at the time and overnight it became the largest in the state, growing from 10,000 acres to more than 45,000 acres in a matter of hours. The JIC remained open from 7 a.m. to 10 p.m. for the first three days, but quickly turned into a 24-hour operation as the fire moved north, blanketing the area with smoke and ash. "The Alaska JIC is populated with PIOs primarily from Alaska but others from the Lower 48 may be assigned as needed," Slater said. The PIOs are requested via the Resource Ordering Status System." Although most of the people working the JIC were local, some were brought in from Utah, Washington and California, all with experience working on large wildfires. PIOs in the field worked in conjunction with those at the center, providing updates and safety information as it became available. Members of United States Army Garrison Fort Wainwright Public Affairs, the Fairbanks North Star Borough, Alaska Fire Service, Bureau of Land Management and U.S. Forestry continually answered phones and assisted members of the community seeking answers. As the blaze threatened homes along Chena Hot Springs Road, an evacuation advisory watch turned into an evacuation advisory. "It was rewarding being able to provide our neighbors with accurate, up-to-date information in a time of need and for the most part people appreciated the immediate response," said Billie Tewalt, FNSB Mayor's office. Some callers were surprised to get a live body at the other end of the phone, expecting a recorded message. As of Wednesday, the fire had burned 85,475 acres and was 57-percent contained. Cooler weather and a solid fire line running from the northeast of the fire to its west side and south have kept it in check. Although the JIC is no longer active, fire information is available by calling 356-5511 or visiting www.fire.ak.blm.gov.